Designing and building your own home theater can be a fun process whether you have experience in design and decorating or not. 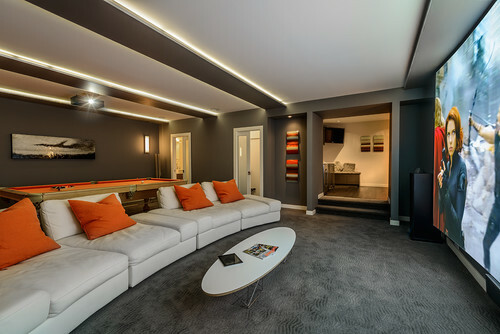 Your imagination, budget constraints and the space available are the only limits when it comes to designing and creating your ultimate home theater (or recording studio) experience. The single most important component of any home theater system is a room itself and its construction can become a complicated undertaking. Items such as construction methods and materials, HVAC, sound isolation, lighting, and electrical requirements, are all extremely important to achieving the acoustical quality of the room. If any of these elements are designed and implemented incorrectly, it becomes very expensive to fix the underlying issues. To avoid the costly mistakes in building a home theater, we listed a few simple rules to help you build your private home theater without a hitch. 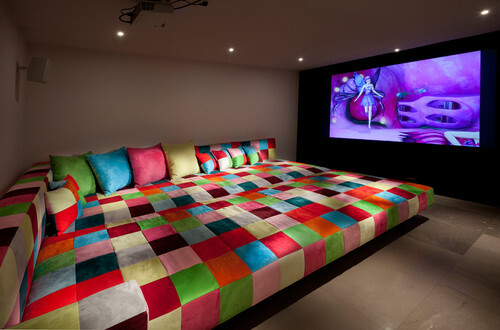 Before you decide on a theme and decorate the room, choose a room in your house that will comfortably fit the home movie theater including home theater seating, furniture, home theater equipment, and sound system. The room must be the right size to accommodate acoustics, home theater equipment and furniture easily without crowding the seating. Also, try to avoid square rooms and long narrow rectangle rooms because the of sound distortion created in such rooms. Instead, build a rectangular shaped room where the dimensions (length, width and height) are not evenly divisible to avoid sound distortion. Once you have selected the room, it is time to make your audio-video plan. For the optimal viewing quality, if your theater room is not completely dark you may choose a rear projection LCD, DLP (also flat-panel LCDs, or Plasmas are all good choices for small home theaters) that produce very bright, high contrast images. Front projection LCD and DLP provide the optimum viewing quality in completely dark rooms and this may not be achievable in some cases of rooms designated for home theaters. Determine your seating distance versus screen size. If you have not set-up a home theater before it is easy to make a mistake by either selecting a screen that is too small or too large. To avoid that costly mistake you can find out the optimal screen size by using the projection calculator on www.projectorcentral.com. Speakers already have their own custom enclosures, that are built for the optimum sound performance and this extra cabinetry will degrade and change the neutral transparent tonal balance that speakers are designed for. For example, deep bass performance will be hollow-sounding, and the midrange and treble tonal balance may become noticeably nasal or muddy and congested. Also put the central speakers as close to the video image as possible. While putting down carpet and hanging drapes will affect a room’s acoustics, there is much more involved in acoustics of the home theater. The acoustic property of the room is greatly influenced by the room architectural design, also the room size and shape all play important roles. For example, one type of wall design (studs and gypsum board) may absorb bass frequencies while another (masonry) will not. Beyond design criteria, the quality of physical construction wall is vital. For example, even if the room is well designed, a poorly constructed wall could let sound penetrate into the room. Acoustic is further affected by interior surface treatments, type of furnishings and even number of people in the room. If the room is already constructed room treatment and furnishings are the only tools available. 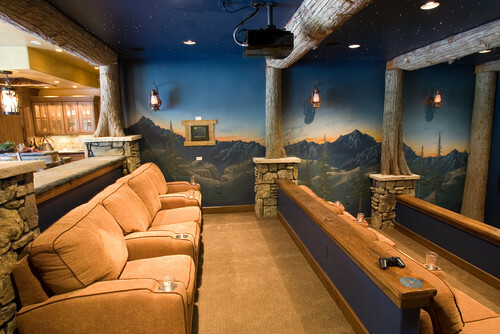 These few simple rules will help you build your private home theater for the optimal viewing experience. 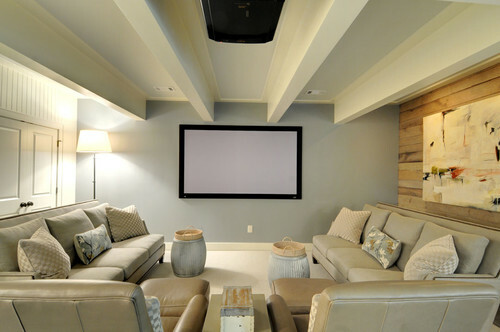 If you would like a consultation on your home theater (or a home sound studio), email us at info@harmonyhomeprojects.ca to discuss your next home theater project.